Optimize the management of your company now !! The times needed to make a large investment in the purchase of hardware and software to manage the processes and management of your company have passed. Currently there are systems that enable businesses of all sizes, regardless of size and investment power, have the tools to manage all the needs that may arise. The concept SaaS (software as a service) and the Cloud (work in the cloud) are the best examples. 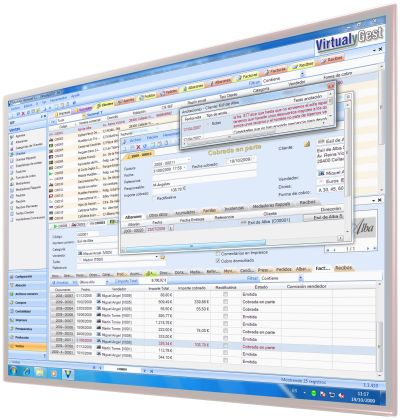 VirtualySoft, ERP VirtualyGEST .NET manufacturer, offers the system SaaS (software as a service), which allows companies to have an application at the forefront of technology without making any investment. In addition to working in the traditional way, on your own computer or server, you have the opportunity to work permanently in the cloud, saving data to a virtual server just for your company, allowing access to data also when out of the company, anywhere, anytime, with encrypted data using the highest standards and safety regulations. NO INITIAL INVESTMENT: Never make any initial investment to purchase the program. Besides the obvious economic benefits, is also accounted for the better, because we must not pass it to an account that remains fixed assets in the balance of the company, losing value every year. CONTROL OF EXPENDITURE: Operated through a small monthly fee (which varies depending on the modules and sessions used, and that includes all maintenance services, telephone consultations and remote control, updates, etc. ), Which also counts as an expense at year end is completely tax deductible, because the VAT of bills can be deducted each quarter and the amount of expenditure is offset in the income year, and therefore reduces the amount payable in respect of Tax Companies. SAFETY FOR ANY INCIDENTAL: Includes an automatic backup of your data and safeguard them in the cloud, which are saved with individual encryption and the highest levels of security. ONLINE ASSISTANCE INCLUDED IN THE FEE: In addition to telephone support, assistance available Online, with a technician always available to answer any questions, no waiting. USER FRIENDLY: The connection to the cloud is performed automatically without the user having to run complicated programs or be a computer expert. From the office or from anywhere with an Internet connection, with a few clicks within the program is displaying the data of your company. NO NEED TO BUY NEW EQUIPMENT: No new equipment or expensive servers that will eventually become obsolete. Using the latest technologies can work in the cloud, using a virtual remote server exclusively for your business, you can hire the necessary requirements at all times as your needs evolve. You only need to have a connection to broadband Internet (ADSL, Cable, Fiber Optics, Wireless, etc).